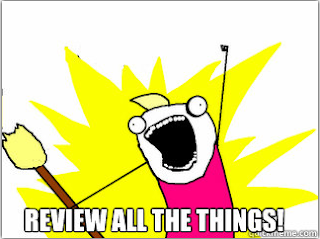 some of you have already expressed, in the survey, the desire for more reviews. well guess what? i agree! only there's this thing called "grad school" that eats my life and makes me sad and grumpy. and sad, grumpy people who don't have time to sleep or eat also don't have time to read multiple awesome books in one week. so i reached deep into my brain-of-brains and pulled out this nifty idea: past reviews! i used to do those! i should do them more! just because a book came out ages ago doesn't mean it's not good! in fact, it means that people probably don't know about it as much and should be introduced to it. so, tada! yes, i made myself an inspirational meme. hush. recommended for: Fans of Diana Wynne Jones, Harry Potter, Artemis Fowl, or other fantasy not-quite middle grade and not-quite Twilight. Lovers of good, clean fantasy. Anyone looking for a quick, light read with an endearing main character and a whimsical plot. Wendy isn't as blind as a bat--there are bats that can see better than she can. Which is why, when her new glasses break, she's all too happy to wear the dorky pair of sunglasses she finds on the lawn. They seem to match her prescription, and that's all that matters if she's going to be able to make it through her school day. But the glasses correct her vision too much. She begins to see things that no one else can see: cheerful corpses, frightening crones disguised as teenyboppers, and portals to other worlds--places where people are all too aware of the magical properties of her new shades . . . and will do anything to get them. This is just something I picked up randomly at Borders long ago. It's been years since I've read it, but it's really stuck with me. It's just fun. No angsty werewolves. No epic sword-and-sorcery battles. Just a gawky teen girl who finds herself in a perplexing situation with bizarre creatures and a cute boy. 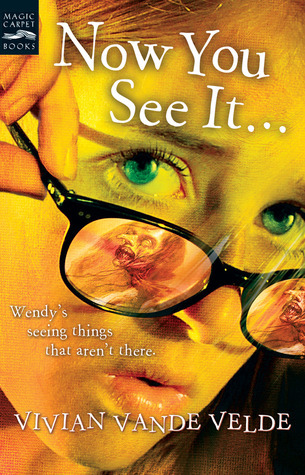 The glasses thing is such a clever way to give Wendy her "second sight." What awkward bespectacled high schooler wouldn't wish her glasses had magical powers? The plot is fast and thrilling, the characters lovable, the romance sweet, and the writing cute and witty. If you're looking for a light read that will make you smile and remind you of those nostalgic fairy tale days, this is your book. It's a short book, so the plot picks up right away and doesn't let go. It's not any Pulitzer stuff here, or Lord of the Rings. It's a bit silly, a bit ridiculous, and that works for it. Give in to the whimsy! Go with the mean girl being a crazy old bat (not literally, ha) and the cute boy having a secret life. Accept Wendy's awkwardness. The set-up is just over-the-top enough that the silly plot twists feel perfectly believable, and fun. I cannot say "fun" enough. Also, the ending made me smile. Loads. Velde just creates such a clever little backstory that's revealed bit by bit. As I mentioned, behold the whimsy! It's silly. Girl breaks glasses. Girl happens to find sunglasses on lawn and tries them on. Girl decides to wear sunglasses. Okay, yeah, silly. But once you get over that, it's such a cute coming-of-age urban fantasy that it doesn't matter. Like all those middle school books you used to read with the outrageous plots, just go with it. It's not the most original fantasy world, but the familiar creatures make it an easy, comfortable read--and allow Velde to add a few twists of her own that are easy to stomach. It's classic and warm and fuzzy in a way few authors can manage. Julian. Mm. That's all I have to say. Okay, if I were still in high school. But seriously...he's adorable and lovable and suave. And Wendy is the opposite. Gawky, nerdy, awkward. Endearingly so. She's every bookwormish kid in high school, and it makes her super relatable. The other characters are pretty trope-y (the mean cheerleader, the weird kid) but they work. You're not meant to marvel at these amazing, original characters...you're meant to relive a little slice of high school with a fantastical twist. Velde is funny. She gets awkward teen speak perfectly, and she just has a great sense of atmosphere. She really did remind me of Diana Wynne Jones at times. She's got just enough dry wit to balance out the silliness, giving you something that's both funny and clever. I just realized that she's written TONS of other books, and I think I'll actually take a look at them. She's got a gift for twisting the fairy tale into something fresh but familiar. Your basic MG/YA kind of writing. Typo-free. Pretty cover with pretty colors. A lighthearted fantasy that takes you back to your awkward high school days, with a magical twist. WANT. :D This book sounds great, and I bet a lot of my students would enjoy it. I hope so! It's very fun and quirky. It's too bad it's not better known.